Cape Town City Hall is a prominent Edwardian building in the centre of Cape Town built in 1905 with honey coloured limestone imported from Bath in Englan. It looks out onto what is called the Grand Parade which is a large open space west of the Castle of Good Hope.You may all have seen Nelson Mandela adress the crowd of 250000 from the balcony after his release from prison in 1990. The City Hall is also the home of the Cape Philharmonic Orchestra which regularly performs concerts there. 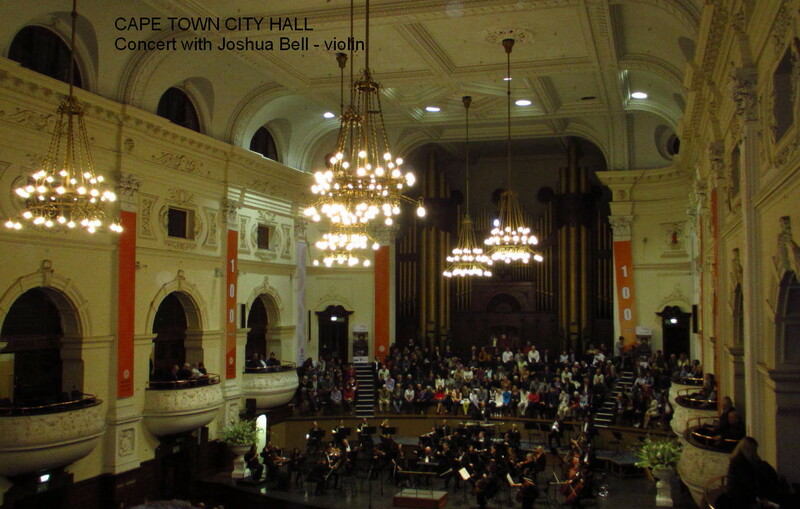 We were lucky enough to attend the last concert where the world-renowned violinist Joshua Bell played the much loved Tchaikovsky violin concerto. One of the reasons this was so special is the fact that Joshua Bell purchased a 1731 Stradivari in 2001 and I wanted to listen to one of those masterpieces again. It was absolutely beautiful. The sound and the range of this instrument are just incredible. Nobody to this day has found out the secret of the Stradivaris unequaled quality. And Joshua Bells musical talent is amazing. The audience was virtually holding their breath when he started playing. What a wonderful evening for us, standing ovations, really unforgettable. Listening to violin is very soothing to the ears. I am sure the violin player must be awesome, wish you could have also posted a small video clip so I would have heard it to. A gander at a portion of the occasions that local people and occasion guests can appreciate in Cape Town, South Africa, this season. Cape Town if good for BBQ food. I find a very good website for the Grill Cleaning Service Scottsdalegrill Cleaning Service Scottsdale. If you want you can visit this site.